I hope you all had a fabulous Mother’s Day like I did. I even got to enjoy breakfast in bed. And it included chocolate covered strawberries. You can’t really start the day better than that can you? I sure love my awesome husband and my kiddos! Project “Decorate the Living Room” is in full swing. And when I say full swing I mean I’m tackling one project a day because I spend most of my time chasing around a one year old that can climb like a monkey and has more energy than a tornado. I’m working on one of the side tables. I put my framed printable on it, but it needed a little height. I decided to wrap some books in fabric and stack them up as a base for my frame. I found a couple tutorials for wrapping books, but they involved spray adhesive, and I was working during naptime, so running to the store wasn’t an option. I came up with my own method for covering books with fabric. And all you need is a hot glue gun. No running to the store, no laying down drop cloths, no having to spray outside. Easy peasy-ness. I like easy peasy when it comes to decorating. 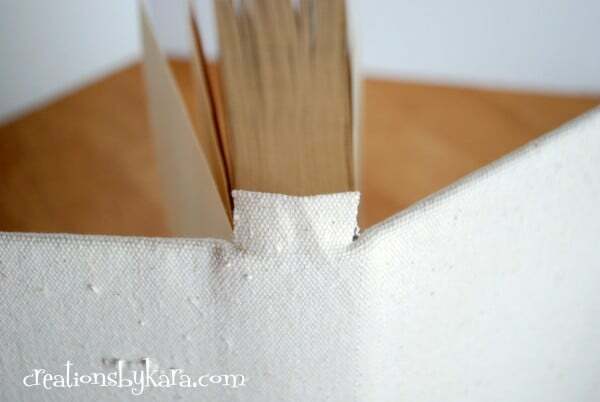 Lay your book spine down on your fabric and open it up. To help it lay flat, use something to weight it down. I used a candle, but a glass, a water bottle, or even a jar of peanut butter will work. 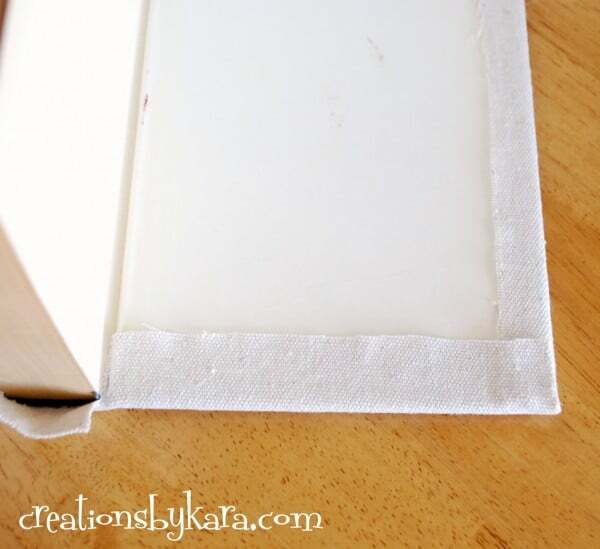 Cut your piece of fabric about an inch larger than the book on all four sides. Tip: If your fabric is wrinkly like mine was, you should iron it first. 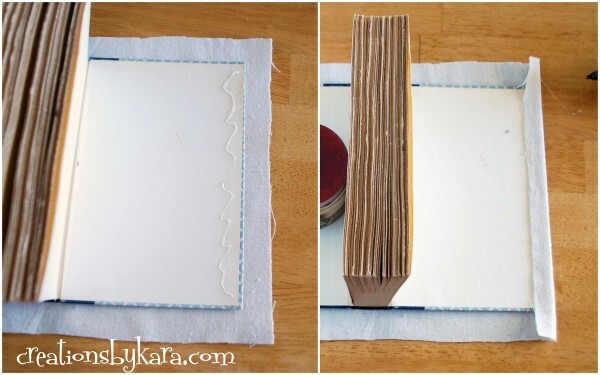 Run a squiggly line of hot glue down the edge of the book and fold the edge of the fabric over tightly. Repeat on the other side of the book. Tip: If you are using a light weight fabric, use a popsicle stick to help you press the fabric down so you don’t burn your fingers. 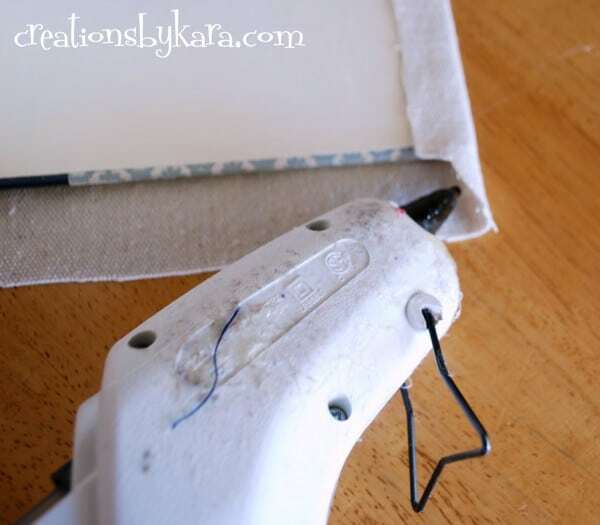 Now cut a notch in that end piece of fabric to remove some of the bulk. (This will help it lay more flat.) 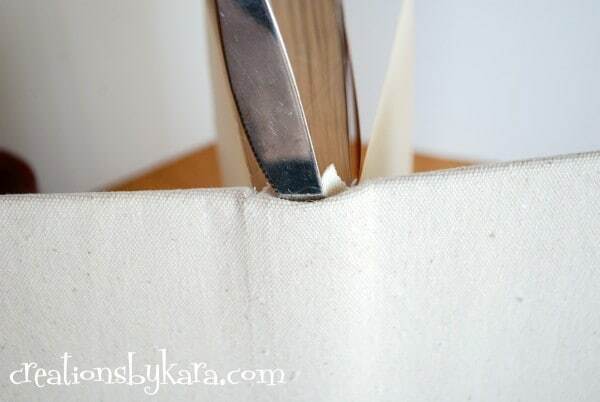 While you’ve got the scissors in hand, cut two slits from the edge of the fabric to the spine. Squeeze a little dab of hot glue into that notch space and pinch it down to hold the fabric in place. Now run some glue up the edge and fold the fabric over just like you did on the side. Repeat the process on the other three ends, and you will be left with just two tabs sticking up at the spine of your book. Trim them to about 1/2″ tall. 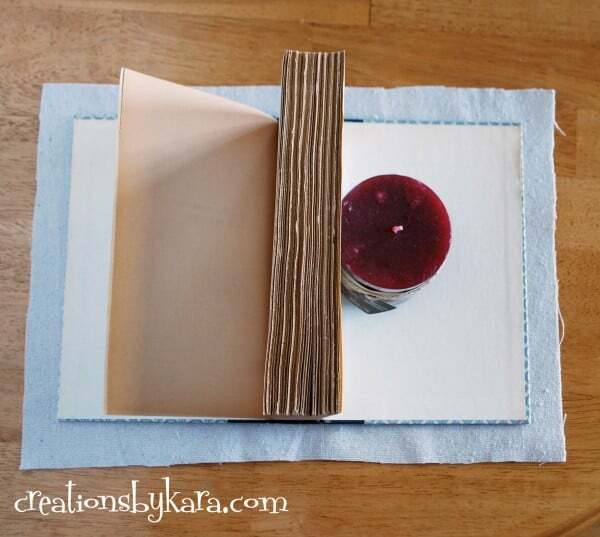 Take a butter knife and push that fabric down into the space between the book spine and the binding. That’s it! Now you have some beautiful books that can be used on shelves, bookcases, or stacked on a table to add height to a decorative arrangement. 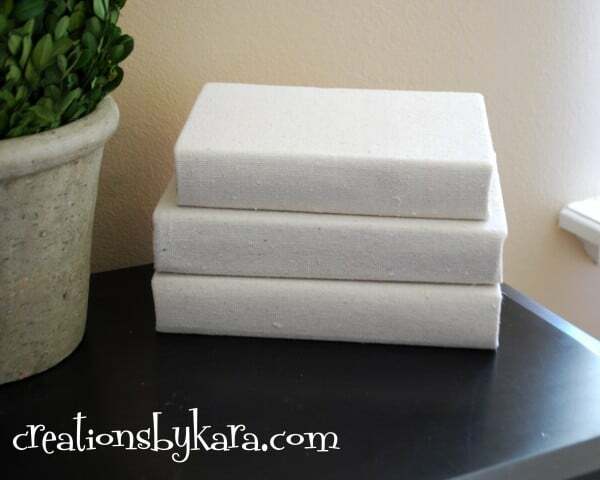 I made three for my table, and I love how they not only add the height I need, but they add some texture. And I whipped up all three in under an hour. Gotta love that! I’ve got one more DIY project to tackle, and then I can show you my whole table arrangement. Can’t wait! I love it. so easy to make. Am I the only one who had trouble being able to *close* the book when I was done? I put the fabric on too tightly and I’ve about destroyed this book ripping the glue off over and over again. Tips? Oh danggit, that is a bummer! I have never had that happen to me. My only suggestion is to try and heat the glue up with a hair dryer. Sometimes that will melt it enough that you can pull things apart. Love this! Can’t wait to try my own. I just used your method for covering some books and it worked perfectly, thank you! Great tutorial, and I love the fabric that you used. Where did you buy that? Can you tell me any more about it? Is it cotton? I have a lot of old law books that I want to recover, and (hopefully!) make them look just like yours. Thank you! Wow I really like this idea! 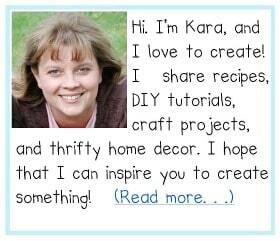 Do you have any ideas of how to do it without a hot glue gun! I fear if I invested in one I wouldn’t use it again so would end up wasting it but would really like to have a go at this! Thanks for the idea! You could use a strong craft glue as well, but I’d recommend using clothes pins to hold the edges down while it dries. If you are using a lighter fabric, I think even double sided tape might work. Good luck! Pinned this so I can find it when I am ready to cover some books. It was so easy that I can’t believe I waited so long to try it! Nice project. I want to try it soon. Your postings are always inspiring. Thanks so much! You really should try it, it’s so easy!